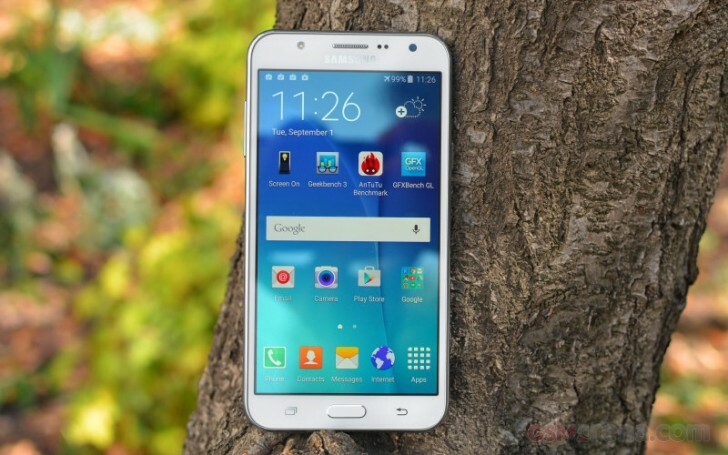 Samsung Galaxy J7 comes with Android 5.1.1 Lollipop and the latest incarnation of TouchWiz. The software is very similar to what the higher-end Galaxy A8 we reviewed recently was running, except some of the premium features have been removed (and some not so premium). The lockscreen follows Android trends with a list of notifications and a couple of shortcuts - dialer and camera. Like the Galaxy S6, you can double tap the Home key to quickly launch the camera. The added weather info on the lockscreen is perhaps not standard Android, but it's useful enough. Unlike the new A8, the Galaxy J7 lacks a fingerprint reader so you get the traditional locking methods on - swipe, pattern, PIN and password. There's no Private mode either, even though Private mode can be set to use only a password. Thanks to the new TouchWiz the Samsung Galaxy J7 can get new garbs at the theme store. The preloaded themes aren't that great, but the store has been progressively getting more variety lately. Themes can change the wallpaper and icons, but also some Samsung apps (dialer, contacts, messages) and the notification area. We wish there was a search function though finding a material theme wasn't too hard. The homescreen is quite normal. You get the optional Briefing pane on the left, which pulls info from a selection of news sources on topics you find interesting. It's basically Flipboard in disguise. There's an option to change the screen grid between 4x4, 4x5 and 5x5, the smallest one is the default. The notification area has one scrollable row of quick toggles with some have text underneath, like the name of the Wi-Fi network you are connected to. The only way to view all toggles is to hit the edit button. The brightness slider is below the toggles. Instead of an Auto toggle it has an Outdoors mode that temporarily boosts the brightness (it will be switched off automatically later to preserve battery). The Samsung Galaxy J7 had a screen worth of apps drawer. Samsung tucked away Google's mandatory apps in a folder and placed its home-brewed alternatives up front. You can disable apps you don't want (but can't uninstall the TouchWiz ones). Samsung has partnered with Microsoft so you get OneDrive (you get 100GB free as a gift), along with OneNote and Skype pre-installed. The 16GB of pre-installed storage can be a little cramped since around 7GB are taken up by the system. Unlike the higher-end Galaxys, the Galaxy J7 does not have split-screen multitasking. We don't know if that's just the product strategy or a technical limitation (the A8 with 2GB of RAM had it, the J7 has 1.5GB). TouchWiz and Android were quite stable during testing, other than the Wi-Fi disconnects.